The orderly stepped aside and the announced officer entered the tent. Outside the sounds of battle were all around. Several explosions sounded near, but after days of constant fighting and battle it seemed most ignored the explosions unless they got very near. Colonel Estara, a stout, bald man looked up from his map table. With a frown at the immaculate and clean uniform of the Wing Commander he moved around the table to greet him and his entourage. Colonel Estara moved forward, put his arm around von Wetzhausen’s shoulder and moved with him towards the tent entrance. Outside smoke and dust was drifting across the area. Shots, explosions and screams were omnipresent. Orders were barked. Estara pushed the Wing Commander towards the berm that shielded the command area at least marginally from the battlefield. They both climbed halfway up the berm, until they were able to look at the battlefield. Smoke, fire, explosions all around. It was indescribable. His arm motioned across the battlefield. “But we can’t – not against these odds!” exclaimed von Wetzhausen. Again Colonel Estara squinted his eyes and then pointed to the sky. Bewildered the Wing Commander looked up. With each word the Colonel got louder. Colonel Estara nodded. Then he glanced over his shoulder with a curt nod. Out of the shadow of the tent the black clad figure of Commissar Sontaya emerged, followed by his massive Orgryn bodyguard Hans. Wing Commander von Wetzhausen looked confused and took a step back. A note of panic in his voice. The commissar’s eyes were not readable behind the small, reflective glasses of his spectacles. Slowly, in a well calculated move Commissar Sontaya opened the holster at his hip, pulled his old fashioned pistol and raised it. The body of Wing Commander von Wetzhausen crumbled to the ground. A look of utter surprise still etched into his features his eyes stared blankly at the sky – the empty sky. Colonel Estara turned around and looked at the Wing Commanders entourage. A young Squadron Leader cleared his throat and stepped forward. The Squadron looked to his accompanying officers and then back to Colonel Estara. Squadron Leader Tubbs swallowed and then nodded. He turned around to leave, but the Colonel held him back. Tubbs swallowed again turned around to the other air force officers and nodded to them. While the other air force officers quickly left the scene, Colonel Estara snipped his fingers at one of his orderlies. While the officers entered the tent the Orgryn bent down and grabbed the dead Wing Commander and set to drag him off. He was stopped by Commissar Sontaya, who bent down and stripped the corpse of any insignias, medals and even the name tag. He would be disposed without any honors. Sontaya turned around and entered the command tent. Totally exhausted they dropped to the ground. Sergeant Gunnarson looked around at his remaining soldiers. Dirty and dusty, several with bloody bandages. Only 50 men left. After days of vicious fighting and constant retreat they finally disengaged from these cursed Greenskins and managed to slip into this ravine under cover of the night. They followed it all night long and now with dawn near they were very close to the Faichem Canyon. The canyon cut through the Giadamak Heights, leading north towards Xanthium and would hopefully lead them close to their own lines again. According to his map it was quite far from the main line of battle and should keep them out of harm’s way for a while. They had lost their last real officer in the evening and since then Colour Sergeant Gunnarson was in charge. He had gathered the remnants of his unit, including Officer Cadet Brunnthaler, who was almost catatonic since the last fight with the Orks. Brunnthaler, a pale, chubby young man had joined the 11th Infantry Battalion just few weeks ago, fresh from training. Captain MacInesker was still trying to forge him into a real man and officer and forced him to stay at the Captain’s side at all times. Before the cursed Orks landed Brunnthaler was put through his paces and MacInesker pushed him to his limits whenever possible. Especially physically. Actually Gunnarson had to admit that Brunnthaler had shown signs of improvements and he secretly respected the young man for never complaining. No matter how gruesome the challenge by MacInesker had been, he never moaned. Brunnthaler had grit his teeth and gave his best. And even in the fighting he didn’t cower. He stayed at the Captains side. Until last evening when they were ambushed by the Orks on the Grimauld Plains. After two days of constant fighting at the foot of the Caledonies they road marched north. Their only means of transport were two Chimeras which transported the wounded and an old and battered truck, which they had commandeered from some scavengers. The truck carried the last of their heavy weapons. The Orks attacked out of a small ravine, destroying the Chimeras first. In the ensuing confusion the Troopers were unable to get their heavy stubbers and autocannons into action and had to rely their personal weapons. Luckily it was a small band of Orks and they attacked without finesse. After the initial rocket attack they jumped form their hiding place and charged straight at them. MacInesker had quickly recovered and organized the defense. They used the burning wrecks of the Chimeras as well as the old truck as cover and laid down a hail of fire. Bolters and Lasguns blazing they mowed down the first wave of Orks. Firing form the hip the Greenskins charged and despite the inaccurate nature of their fire, many bullets found their mark. Vicious hand to hand fighting ensued and the massive Orks killed many soldiers with their blades and even bare hands. Captain MacInesker wielded his power-sword and killed two or three of the Orks. But then a huge Ork, clad in crude armor, carrying a huge two-bladed axe as if it was a child’s toy attacked him. MacInesker was able to block the first strike with his sword and the young Brunnthaler beside him managed to swipe his sword at the Ork brute. But the Ork simply batted the Cadet to the side and pushed on. The next swing of the axe jarred MacInesker’s arm and he was unable to parry the following attack. In a wide arc the axe came down and almost split the Captain in half. But before the Ork could continue his attack he was finally hit by several bolter rounds and crumbled to the ground. He came to rest right beside the corps of his last victim, Captain MacInesker, the last officer of the 11th Infantry Battalion. Only when Gunnarson was able to get the remaining flamethrowers into action were they able to stop and repel the attack. It was almost dusk when the last Ork was killed and they were finally able to breathe and take stock. They were shocked to see so many dead. The truck was damaged beyond repair and most of the heavy weapons destroyed. Unsettled Colour Sergeant Gunnarson realized that he was now in charge. Officer Cadet Brunnthaler sat beside the corpse of Captain MacInesker, rocking slowly back and forth, mumbling words no one understood. A count revealed that only 50 soldiers had survived. Several wounded. After conferring with the other surviving NCO’s he decided to head east, using the very ravine the Orks had used to set their trap, and attempt to reach Faichem Canyon and travel back to their lines. They used the cover of the night and moved down the ravine, constantly heading east. As dawn neared they reached the end of the ravine. According to the map they were almost at the entrance to the canyon and would only have to cross about one kilometer of open ground. Gunnarson ordered a halt and they dropped down totally exhausted. But before they could rest Gunnarson motioned to Lance Corporal Dupree and ordered him to climb the ravine wall and scout the area. He wiped the sweat and dust from his forehead and was just opening his canteen when Dupree slid back down and kneeled beside Gunnarson. With this he pointed back up the ravine wall. With an exhausted sigh Gunnarson got up and climbed the wall with the Lance Corporal. Bemused Sergeant Gunnarson crept up the last centimeters and looked across the edge. He had blisters on his hands, his back hurt and he was thirsty. But the guard was very alert, and he was quick with his light-whip. Twice N056223 had felt the burning sting of the whip on his back because the guard felt he was working too slowly. They were working here outside the Xanthium citadel for three days now. Digging trenches and defensive positions just short of the southern tip of the citadel. Where the two lava chasms almost met. Here the Lord General planned to make the last stand before the citadel itself. The network of trenches, foxholes and newly emplaced pillboxes and dug-in tanks was extensive. Thousands of slaves like N056223 were digging into the hard packed ground, often forced to use explosives to cut through the rocks. Even though they had many power tools like jackhammers, diggers and power shovels it was bone-breaking labor. The sun was constantly burning down on them and they were only allowed to pause for a cup of water once per hour. Every three hours they would get a 30 minutes break. Many of the other slaves slumped to the ground then, but N056223 had realized that it was getting harder to get back up every time. So he mostly remained standing, tried to sooth his aching muscles and look for bits of shade. The guards were merciless with their shock-staffs and light-whips – sometimes without real reason. Twice they executed an example and beat a slave to death because he tried to run away. But many slaves had already died without the guard’s interference. Simply from exhaustion of dehydration. It was gruesome. This morning N056223 and about one hundred other slaves were moved to a new position, a few hundred meters to the south, to start a new trench. From the width and position between the lava chasms N056223 had assumed some kind of anti-tank ditch. But they were building up berm in front of the ditch with the excavated. And by now the trench was way too deep and wide for a simple anti-tank ditch. It was about 3 meters deep and at least 10 meters wide. 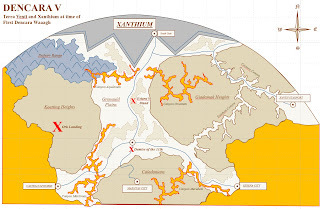 Only the highway, connecting the southern cities with Xanthium was still intact, crossing the trench. But the engineers were already positioning explosive charges to the road itself as well as to the supporting ground. By now N056223 and the other workers had almost connected the trench to the western chasm, the Canyon Aquilonem. And as the engineers moved to this end of the trench with even more explosives N056223 began to understand what Lord General Rees had planned. It seemed he planned to create a continuous chasm filled with lava from the western Daharr Range over to the cliffs of the Giadamak heights. It wouldn’t be an unbridgeable obstacle, but it would hold the enemies advances in check for a while. And while the Orks tried to bridge the gap, they would be under fire of the defense line the slaves just built as well as the major gun batteries of the citadel itself. Lieutenant Kiruban nodded to the signals sergeant, straightened up and walked over to the plotting table. “We’ve lost contact with another unit.” She said with a worried look on her face. “Which and where?” he asked looking back down at the maps. “Any news from Marsitas City?” he asked looking at her. The strain of the constant battle and bad news showed clearly on his face. The lines etched deep into his features, as well as a constant frown and sometimes a slight hunch to his shoulders. Walking around the plotting table he asked. “Not the wisest, but a sensible move” Colonel Estara said with a nod. “But apparently they never made it.” Her jaw muscles tightened when she continued. Again she looked at the PDA and continued. Before the Colonel could say anything she continued. “You certainly know your job.” He said with a tired grin. “So we have lost most of the South.” His hand pointed to the south of the map. He looked at the assembled officers around the plotting table and continued. With grim satisfaction he saw the worried looks at their faces. “I’m sure we can’t have lost all the men of these units.” Said a young Captain from the Artillery unit Estara had requisitioned a few days ago. Colonel Estara nodded and then looked at Commissar Sontaya. “Yes we are.” The black clad Commissar stood rigid, hands clasped behind his back a bit apart of the other officers. “But it seems we have exceptionally high losses.” He said with an unreadable expression. His eyes hidden behind the reflective glasses. The Colonels eyebrows shot up. “Do you presume foul play?” he asked with concern. The Commissar stroked the little goatee at his chin and said. “Some of my peers are very eager to serve the Emperor and the Governor in these times of need.” With an almost toneless voice. “Sometimes they may get carried away in the heat of battle and they may rush into…” he paused for a moment. Colonel Estara was sure that the Commissar was secretly leering at his mostly noble peers, but not a note of humor or irony was in his voice as he continued. “But you may also know that each Commissar has a Ogryn bodyguard.” He said looking at the other officers. Most officers looked very surprised. His hands made little quotations around the last two words. He was sure that most of the assembled officers were now worried even more about the Commissars attached to their units. Most officers suspected the Commissars to spy on them and many feared negative reports and repressions from their superiors if the men in black forwarded any unfavorable comments. But not one had given the brutish Ogryns any special consideration beyond their physical presence. The knowledge of a separate Ogryn communications network would change that quickly. “Good!” the Colonel clapped his hands and straightened up a bit before continuing. And with an almost evil grin. He too made little quotations around his last words. They stood between the two tanks of Captain Xieng and Commissar Yamoto. He pointed at his map. “They won’t even know what hit them.” Exclaimed a young Lieutenant now in charge of 17 armored vehicles. “We will charge!” interrupted Commissar Yamoto. He looked first at this commanders and then back to Commissar Yamoto. He secretly shivered when he looked into those cold, dark eyes, the pockmarked face and the greying short cropped hair. The Commissar was thin, if not to say gaunt. And while the black uniforms of most Commissars looked menacing, his uniform looked sloppy, loose fitting as it was. Whatever he may have done in the past, he seemed to be eager to erase any bad spots in his dossier, by driving them crazy with his endless motivational speeches, numerous reports to the High Command, and his demands for draconic punishments for the slightest misdeeds. Captain Xieng was sure that Yamoto would have experienced several mortal accidents already hadn’t it been for his hulking Ogryn bodyguard. Even though Xieng had to admit that he wasn’t always sure if the brute was really a protector or more a watchdog to the Commissar. “Hopefully not a blunt one” said the Commissar with a leer. As soon as Captain Xieng had disclosed his plans with Yamoto it was clear that the Commissar didn’t judge the attack as heroic enough. In his mind they should have attacked immediately and charged right into the middle of the enormous Ork marshalling area. It would certainly be a heroic attack and would most likely kill many Orks, but it would also be the end of the 3rd Battalion of the 69th Armored Regiment. As far as they knew the Greenskins had very little tanks and vehicles at the start of their invasion, but by now they had looted many tanks and guns from the Imperial units they had fought and defeated and had pressed them into their services. They even painted them red, thinking this would make them faster and more menacing – ridiculous! And their sheer numbers were still overwhelming. It was incomprehensible to Xieng how so many Orks could have fit into the six ships that crash-landed on the surface. Luckily Xieng had reviewed his plans with Colonel Estara, currently the highest ranking officer south of the Xanthium defense line. Estara was very supportive of Xieng’s plans and he even designed the attack into the enemies’ rear by Tufail’s group. Grinding his teeth Commissar Yamoto had accepted the orders, but he missed no opportunity to criticize or belittle the plans. With a nod he said “Dismissed.” And turned to his tank and climbed up the hull. Dunja didn’t know how often Coriano had asked her over the last hours. As a matter of fact, the tribe would most likely expel her and she would not be able to return to the Scarabs at any time. Dunja stood at the edge of the cliffs and pointed down at the country below. It was shortly before sunrise, but light enough to show the chaos below. A mass of bodies, fires and smoke covered the landscape. Thousands of Orks occupied the area, resting for the night. But it was clear they would soon be on the move again. Continuing their fight. Destroying and killing everything and everyone in their way. A flood of destruction. 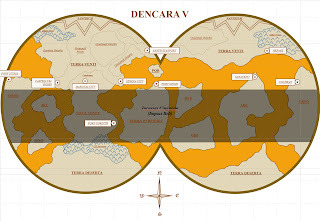 The Scarabs were an almost nomadic people on Dencara. Organized in tribes they constantly roamed the lands. They harvested ores and precious metals, often from crashed asteroids or meteors. They were a very proud people and usually kept well separate from the Imperial settlements. Only to trade did they connect with the Imperium. And the Imperials had no special amity for the nomads either, as the Scarabs usually didn’t accept Imperial laws and traditions. They were part of the Empire, but never really accepted the Imperial way of living and culture. Keeping their own identity. Both sides faced each other suspiciously, but grudgingly accepted each other, as they needed each other. Only the Scarabs were adventurous enough to mine the precious ores even in the Incussus Cingulum – the Impact Belt – were an almost constant bombardment with meteors and asteroids made live impossible. It was a dangerous way of live, but it was profitable and here the Scarabs were their own masters. With their own way of tackling problems and their ingenuity they designed and built mobile mining facilities that was able to harvest large amounts of ore. Other tribes specialized on collecting metals, asteroids and meteors on the surface. Yet others had taken to the underground caves to search and excavate the precious materials. Even though this was often frowned upon by other tribes, as it came very close to the Imperial style of living, where most of the cities were underground, protected from any aerial bombardments. Again she pointed down at the destruction below. Coriano swallowed hard, he had heard the gruesome stories form the two survivors who made it back to the tribe. On the second day of the invasion, when only a few even knew what was going on, the Orks attacked Castellum Hobbs, a coastal settlement with a busy port on the western coast of Terra Venti. Without warning the Orks rushed down from the Koetting Heights and like a flood they overran the city. There were only a few survivors who escaped the carnage. “But they not want you! You now they not like us!” Said Coriano excited. She had taken off her traditional brown overalls of the Scarabs and donned now the standard Imperial baggy pants and long jacket. It had been hard for to take off her overalls. They were a central part of a Scarabs identity and displayed their affiliation with their tribe as well as their experiences and journeys. Covered in symbols, each standing for an important meeting with others, a journey taken, a story told, a test passed, they were a proud symbol of their way of live. Dunja had packed her overall very careful in her backpack, but in all honesty, she did not expect to ever wear it again. With these word she thumbed her chest. Her dark skin shimmered in the pale light, together with the black clothes she wore, she was almost invisible in the dark. Just a silhouette against the faint light on the horizon. Suddenly she made a step forward and hugged her brother fiercely. Then she turned around and walked away. After a few steps she vanished in the dark. The area just in front of the ravine was crowded with Orks! Gunnarson and Dupree slid back down to the bottom of the ravine. “They must have passed us during the night, while we were struggling through the ravine.” Said Gunnarson. “It must be at least 500 of them!” whispered Lance Corporal Dupree. While the two whispered with each other Officer Cadet Brunnthaler had gotten up, apparently shaking off his stupor, and climbed up to the ravine’s edge. The heads of Dupree and Gunnarson whipped around and with a jump Gunnarson grabbed the Cadet, while Dupree put his hand over Brunnthalers mouth. Why had the officer escaped his catatonic state at this very moment, and why did he have to endanger them with his loud demands? Gunnarson was ready to strangle the young man. He looked up to the two guards on the ledge. Both shook their heads and then looked back out at the Orks. Luckily the Orks had not heard them. So far! Both looked into his eyes. Slowly Brunnthaler relaxed, stopped fidgeting in Gunnarson’s arms and finally nodded. Ready to immediately silence him again, Dupree slowly removed his hand from Brunnthalers mouth. “Are you OK, Sir?” asked Gunnerson, releasing the officer. The young man rubbed his face with his hands and then looked at the two NCO’s. Apparently Brunnthaler didn’t recall the events of the night that let them here. When he saw the flicker of panic in the young man’s eyes he was sure he’d start to scream again and got ready to silence him immediately, but Brunnthaler nodded slowly. His eyes seemed to lose focus as he remembered. Gunnarson grabbed him by both shoulders and shook him. Brunnthaler looked up. His eyes jumping from one to the other of Gunnarsons eyes, just as if trying to catch the lie. “It was a carnage!” added Lance Corporal Dupree. Lieutenant Kiruban put her headphones to the side and walked up to Colonel Estara. Estara quickly got up from the cot he used in the command tent to get at least a bit of sleep. She gave a sign to the communications specialist. After a short period of hissing on the speakers a voice came through. The command tent got really quiet and almost all present looked up at the speakers. A gasp of shock was audible through the tent. The 11th Infantry Regiment originally consisted of more than 2.500 men. While Colour Sergeant Gunnarson recounted the ambush and the defense, as well as the nightly march through the ravine the silence in the command post was complete. Estara, Kiruban and many offers looked at the plotting table as Gunnarson gave the coordinates. But before Estara could continue the radio squawked again. Estara nodded to the technicians, and a live video feed replaced the map on the plotting table. The image transmitted by the recon skull showed the Ork lager with the silhouettes of sleeping bodies littering the ground. 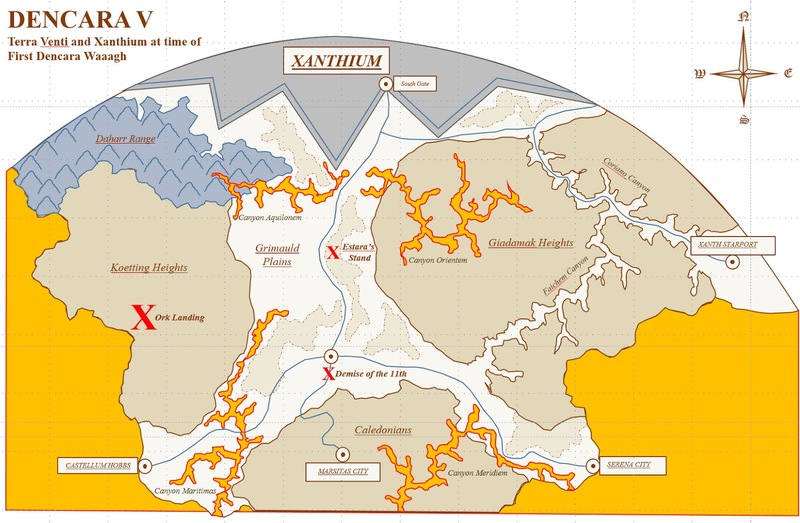 Everyone was aware that Faichem Canyon was a direct route to either the Xanth Starport or even up north to Xanthium. Colonel Estara looked at the video feed and the sleeping Orks. He considered the imminent attack of the 3/69th. That attack was just too promising and they would definitely cause great damage to the forces just south of his position. It would be foolish to stop that attack and detour the forces south. Estara was torn by his feelings. He wanted to help those brave soldiers out there. But his options were slim to say at least. Captain Xieng looked over his shoulder to the horizon. The sun was rising and the first rays of light were creeping over the ground. He tapped his headset and spoke into the microphone. The engines of over 90 vehicles came to live. They positioned them only a few minutes ago directly below the ridge and Xieng had ordered the drivers to re-start the engines without the typical revving and roar. Even though the Orks now had no chance of escaping, he didn’t want to give their presence away. Another look over the shoulder. He had to squint his eyes, as the top quarter of the sun had now risen beyond the horizon blinding him. In a well-rehearsed maneuver the tanks moved up the ridge, exposing the turrets and guns. Along a front of 2 kilometers battle-canons, laser-guns and bolters opened fire. He had ordered the commanders to target the enemy’s vehicles first. Initially the Orks had no vehicles or heavy weapons, but they overwhelmed the first units by sheer numbers and captured many vehicles. Looted as they called it. The Orks had even painted several of the tanks in red, adhering to their superstition “Red is Faster”. Xiang snorted at that thought. The noise was deafening. The cacophony of sound, smoke and light was almost unbearable, and Xieng considered moving into the turret and closing his hatch. But he wanted to keep an eye on the situation and progress. After the first kill his main gunner Colour Sergeant Jin had already switched targets and engaged the next enemy vehicle. Raising his binoculars Captain Xieng watched the battle unfold in front of him. Well, it wasn’t a battle yet. The Orks didn’t know what happened to them. Blinded by the light they couldn’t see the tanks hidden behind the ridge. They only heard the sound of gunfire and experienced the numerous explosions of their vehicles. Many Orks had still been sleeping, others were just getting up, but only a few were more or less battle ready. The Orks lager wasn’t as organized as an Imperial marshalling area would’ve been, and so the vehicles were scattered all over. Several gunners had no longer any vehicular targets in their sector and the loaders switched to explosive ammunition. “Up!” barked Sergeant Yeo, the primary loader of his Macharius tank. The turret twitched a bit to the left and the next shot went out. The recoil shook the tank, the muzzle flash momentarily blinding Xieng, and the blast raising dust. The spent cartridge flew out of the loaders hatch. “Target, Infantry, 1500, HE!” yelled Jin, and Yeo slammed the round into the breach and closed it. “Up!” he yelled stepping to the side. The shot rang out. The same happened all over the battle line, shot after shot went out, explosion after explosion slammed into the enemy. Soon he would give the order to move out and start the second phase of the attack. Xieng and his heavy tanks were at the northern edge of the attack line. The lighter tank groups positioned in packs of 17 vehicles distributed south, following the line of the gully they used as cover. “Corporal Zhang, get ready” he addressed the driver using the internal channel. Once the driver acknowledged Xiang switched to the Battalion channel again. This was now a very crucial moment. So far they were stopped behind cover, with the additional bonus of the sun in their back, blinding the Orks. But now they would move. Starting an all-out attack. They had often rehearsed group moves in maneuvers, but this was the real thing. The commanders of the packs had to ensure the groups stayed together, not impeding the other groups and keep their position in the formation. “ATTACK!” the order rang through the headphones. Engines roared, exhaust smoke plumed up and the vehicles shot forward. Some drivers were overexcited and their vehicles literally jumped out of cover, crashing back down and racing forward. “Keep firing!” ordered Xieng as the vehicles moved on. Now all weapons of the vehicles could come to bear. The bow and sponson mounted guns got into the fray. It was a mad ride! The vehicles rumbling over the uneven ground, Xieng finally slipped down into the turret, closing his hatch as more and more dust and smoke rose up. He had to brace himself against the violently swaying vehicle. The next shot of the main gun rocked the turret. Shrouded in dust and smoke the formation moved across the plains. The Orks began to rally and the first reply shots were fired. Far to the south he could see a tank ripped apart by an explosion. “Damn!” he whispered to himself. They had started the battle at a distance of almost 3 kilometers, but their mad charge was closing the gap fast and he had to ensure the next phase of the attack was executed in time. The plan was for the entire formation to change course north and drive a full circle, that would keep them out of direct contact with the Orks, but upon completing the circle they would engage the Orks again, and hopefully repeat this maneuver at least one more time, before disengaging and returning to their lines. “For the Emperor!” continued the Commissar. Xiang slammed his fist into the turret rim. “Stick to your orders!” he yelled into his microphone, then he switched to the internal comms “Sergeant Misu, can you block Yamato?” he asked his Communications Operator, sitting in the bow of his tank. “Yes Sir, the Commissars channel is now blocked, he can only talk to himself!” he replied with a grin. Momentarily put off balance as the tank rumbled over a rock, he put his hand out for support and switched back to the command channel. “Maneuver elements, turn north, NOW!” the tanks of his heavy group drove straight ahead – as planned. The individual packs of tanks turned north and began executing a wide circle. The guns remained trained at the enemy, and the bow and sponson weapons kept on firing as long as possible. As far as Xiang could see his units were executing his plan flawlessly. “Heavies, lets fan out and see if we can’t drive some Greenskins into the gorge!” he yelled upon switching to the groups separate communications channel. Looking through his sights he saw Commissar Yamoto sticking his torso out of the Malcador’s hatch and waving his signal flag. He had realized his radio wasn’t transmitting any longer to the group. The Commissar was frantically waving the “Attack” flag at the group. “This idiot is just not getting it!” Xiang muttered, making sure his microphone was switched off. Despite the surprise and initial success of the attack, Xiang was well aware that his armored group was way too small and weak to get into a direct fight with the Orks. They had to stay out of range, had to keep moving and out-maneuver the enemy. Only then did they have a chance to inflict heavy damage at the enemy and remain alive to fight another day. But apparently this was beyond the Commissars brain capacities! Captain Xiang checked the battlefield again and confirmed the maneuver elements were executing their circular sweep, keeping out of direct contact with the Orks, but keeping them under fire all the time. At the same time he and his heavies were now forming a line formation, attempting to drive the Orks further north. Here a deep lava-filled ravine cut the plains and marked the border of their attack area. “CHARGE!” apparently Yamoto and his crew had managed to overcome the jamming of their radio. Xiang had to do something about this idiot! “Get us closer to Yamoto” he said to the driver, Corporal Zhang. “Yamoto, you’re too close to the ravine! Watch out” he yelled, now switching to the open Battalion channel. Sergeant Jin looked surprised. Through his sights he could see that Yamoto’s Malcador tank was driving at a safe distance to the ravine. “Concentrate on the Orks!” Xiang said, realizing the gunners stare. “Sergeant Suren, I need you to leave your station.” The gunner in the right sponson looked surprised, but left his seat immediately. “YAMOTO! You are too close!” Captain Xiang yelled again, at the same time signaling to Zhang to move further right, closer to the Commissars tank. Both tanks were now driving at full speed, rocking and swaying wildly on the plains. A large cloud of dust rising behind them. They were obscured from the rest of the heavies as well as the other maneuver elements. The crash was louder than Xiang had expected it. Metal screamed. If he hadn’t braced himself against the console he would’ve smashed his skull. The momentum of the drive kept pushing them forward. Sergeant Suren, who had left his standard battle position had to stuggle hard not to crash into the gunner’s seat, behind which he stood. But looking at his former position, he was glad he had moved. “Full throttle!” the engine protested as Zhang pushed it to the limits. Like a fighting bull the tank was plowing into the side of the other tank. Still driving at full speed Yamoto’s driver was unable to negotiate the pressure and his tank veered to the north, straight at the ravine. “You are going to drop! Stop, stop, stop!” Captain Xiang yelled, switching to the open channel again. At the same time he frantically waved to the driver to continue the push. Regardless of what the crew thought, there was no way back now! They had to finish what they started. Obscured from sight, the rest of the Battalion only heard what Xiang yelled via the open channel and had to believe that the Commissar was so lost in this cause, charging the Orks that he lost control and was now dropping into the ravine. As soon as Zhang felt the other tank slipping he yanked his controls back, steering away and breaking as hard as he could. Xiang was hoping the push had been strong enough. He popped his hatch open and emerged from his turret. Through the dust he could clearly see the Commissars tank, lying on its back, sliding down the ravine into the lava. “You stay inside!” he said to his crew as he climbed off the tank. He drew the pistol from its holster and carefully moved to the edge of the ravine. The tank sank deeper and deeper, its metal turning red and then hot white. No one was getting out. He waited until the tank vanished in its entirety. Then the holstered his pistol and climbed back up the tank. He suppressed a grin as he climbed back inside. “We have lost Commissar Yamoto!” he spoke in a toneless voice into the microphone. He wiped the sweat from his forehead. It was narrow and cramped in the cabin, but it was the largest cabin on the airship. He had forced the captain to throw out the family that had already occupied the cabin. Strohmaier wasn’t sure if the family was on the airship of left behind. He didn’t care. He just had to leave Marsitas City. The Ork invasion had thrown a huge wrench into his operations. Trading on Dencara would be suspended for a long time. Surely, he could make an enormous profit now, when clothes and edibles were needed by the refugees, but in the long run it was too dangerous. He had set up some of his most trustworthy agents to remain in Marsitas and run shop as long as possible. They should sell whatever stocks he hadn’t moved yet. This way he could minimize losses. In the meantime he had to prepare his escape. Dencara V. was a small planet in an insignificant solar system, but if you were ruthless enough you could become filthy rich. And he was proud of it. Born into a reputable merchant family in the Dencara system, he had grown up sheltered from the burdens of the lower classes in Xanthium. But he had always realized there were others more powerful which could bully him around. He had sworn early on that he would use whatever means necessary to establish a power base for himself protecting him from most outside interference. Already as a teenager he became ruthless and used blackmail or the physical help of a several paid bullies to ensure the cooperation of others. With a few shady credit transactions he gained influence into some of the noble houses, which in return gave him many trading advantages that other merchants could only dream of. As soon as he inherited the family business he ramped up his operations. He wasn’t shy with whom to trade. He had no moral obligations whatsoever. He traded with Scarabs and the Dencara noble houses, but also with many other systems, bypassing official channels and trade routes. He traded almost anything. Slaves, precious ores, weapons, food – nothing was excluded. Now it was him to bully others around. Again resorting to blackmail, shady credits, and physical violence he displaced most of the smaller merchants. He even managed to be the only trader in Marsitas City. Making him one of the most hatred men there, but also the most powerful. Even more powerful than the city magistrate. His exclusive trading position allowed him to dictate prices and availability. It gave him a unique position of power. His palace on top of the hills, towering over Marsitas City was an unmistakable icon of power and aplomb. But the loss of Castellum Hobbs and the news of the war he received told him it was time to pack up and head for safer waters. Apparently the units assigned to protect the pass into the Caledonians had been defeated and the local Militia was preparing demolition charges to block the passage to the city. Strohmaier was unconvinced that these feeble efforts could stop or even slow down the Ork attackers. The “Timasevich” was the last airship leaving Marsitas City. It left in the middle of the night and was heading straight for Xanth Starport. It was a pretty small airship and susceptible to the turbulent updrafts of the lava streams. Instead of flying in a straight line it had to follow the coast and fly in a wide arc north-east. His own trading vessels had already been confiscated by the Governor while they were in Xanth Starport. A clear sign that times were changing. But in Marsitas City he still had enough power to ensure a passage on the Timasevich and that the cargo hold was filled with his crates. Officially they contained scrap metal and other worthless goods, but they were filled with his personal stash – gold, diamonds, stocks and bonds. He had to leave many of his blackmail arguments behind, but the most effective or valuable ones were with him. One of his interstellar ships, the “Insatiable”, was in transit to the system. She would arrive tomorrow. He had detoured her to Dencara VI, the agricultural world, where she would avoid confiscation. Strohmaier had also secured the help of a smuggler, which would await him in Xanth Starport to break the blockade and run him to Dencara VI. Sweating profusely he sank onto the cot. He wasn’t made for physical exertions. He never needed to. He always had the assistance of others to do take care of these aspects of his live. Strohmaier had always been large and heavy set, but over the years he had become overweight. Most people called him fat behind his back, but no one dared to say this to his face. 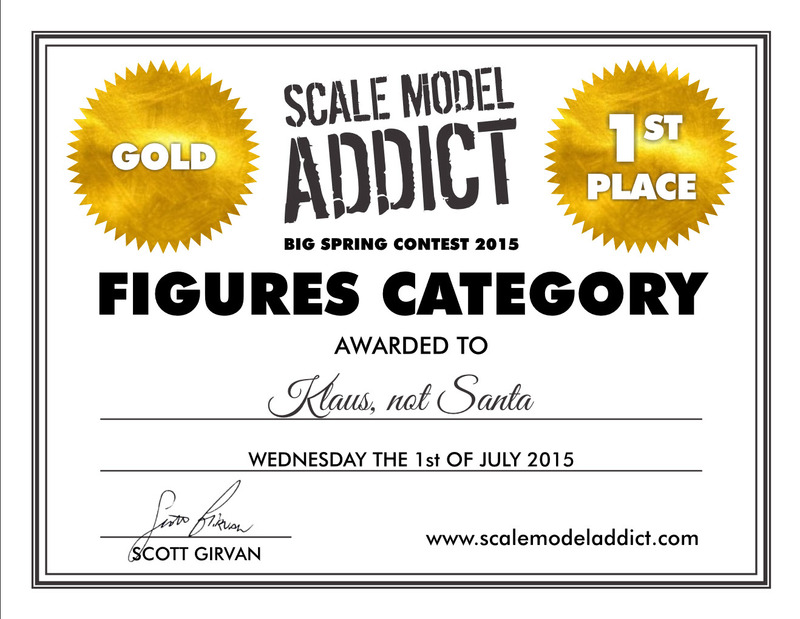 However there was no denying, with 175 Centimeters height and a weight of 190 Kilograms it was clear that he was fat. He had shed his usual brilliant and colorful clothes and donned the black frock of a travel friar, but he knew this masquerade wasn’t very convincing. In Marsitas Citiy it didn’t matter. Nobody would take a chance at trying to stop him. But the less people knew about his whereabouts the better. And once in Xanth Starport he planned to vanish immediately. No need to call the authorities attention to his arrival. It would be prudent to have no pursuer or observers when arriving at his meeting point with the smuggler. He still had a few hours before arriving and he hoped he could get some sleep during the passage. Strohmaier had paid the captain more than enough money to ensure an undisturbed sojourn. Colonel Estara had just ended his call with Gunnarson when the flap of the command tent was opened again. A huge Ogryn stepped in and held the flap open. The Ogryn wore Master Sergeant Stripes and was armed with a Ripper Gun, Grenades and adorned in Sherwood Green Flack Armor. He looked closely at all in the tent, then turned and nodded behind to those that followed. Commissar Sontoya’s bodyguard Hans stepped forward growling at the unknown Ogryn and Estara saw several attendees reaching for their holsters. A group of Officers entered the tent. They all looked unfamiliar and their uniforms looked strange. 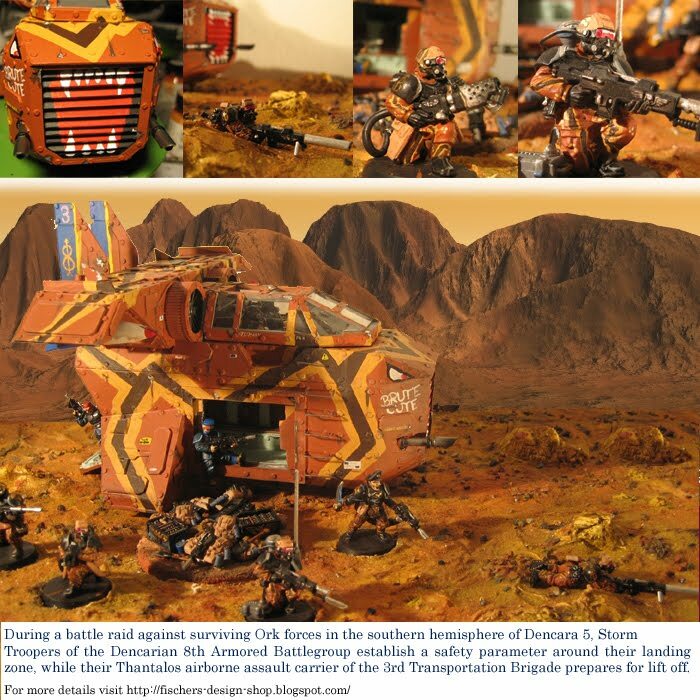 They were without the typical Dencara camouflage pattern and some pieces looked as if they were repainted to fit into the orange-brown Dencara landscape. “Greetings Sir!” said the leading officer, saluting to Estara. “Sorry to interrupt your briefing.” He looked around at the defensive posture of some attendants. “PDF exchange program? With Cadia?” he looked around at his staff. “You ever heard of anything like this?” When he saw only shacking heads he turned around. Lieutenant Kiruban let out a short whistle. Jacka grinned and continued “We are well accustomed to your climate and landscape. We’re also eager to help. My Officers”, Jacka said indicting the others with him. “LT Col Stewart Conner.” pointing at a Squat, “CO of the 12th Cadian and the 2IC of the Orphans.” The Squat bowed. “My Lord Commissar Nugen Wu.“ A slight nod from oriental Officer as Jacka continued “Lt Aron Jenks my Adjutant and Senior Vox Operator"
He's not Cadian, a Carolonian thought Estara, his memories of General Hunter still fresh in his mind even though the Black Crusade was some time ago. Jacka continued, “OC of Black Company and my wife Maj Sarah Jacka,” Estara noted the red haired woman before him and returned her salute.